Dalmatia is an interesting place to study the use of wild greens as it lies at the intersection of influence of Slavs, who do not usually use many species of wild greens, and Mediterranean culinary culture, where the use of multiple wild greens is common. The aim of the study was to document the mixtures of wild green vegetables which are sold in all the vegetable markets of Dalmatia. All vendors (68) in all 11 major markets of the Dalmatian coast were interviewed. The piles of wild vegetables they sold were searched and herbarium specimens taken from them. The mean number of species in the mix was 5.7. The most commonly sold wild plants are: Sonchus oleraceus L., Allium ampeloprasum L., Foeniculum vulgare Mill., Urospermum picroides F.W.Schmidt, Papaver rhoeas L., Daucus carota L., Taraxacum sp., Picris echioides L., Silene latifolia Poir. and Crepis spp. Also the cultivated beet (Beta vulgaris L.) and a few cultivated Brassicaceae varieties are frequent components. Wild vegetables from the mix are usually boiled for 20–30 minutes and dressed with olive oil and salt. Altogether at least 37 wild taxa and 13 cultivated taxa were recorded. Apart from the mixes, Asparagus acutifolius L. and Tamus communis L. shoots are sold in separate bunches (they are usually eaten with eggs), as well as some Asteraceae species, the latter are eaten raw or briefly boiled. The rich tradition of eating many wild greens may result both from strong Venetian and Greek influences and the necessity of using all food resources available in the barren, infertile land in the past. Although the number of wild-collected green vegetables is impressive we hypothesize that it may have decreased over the years, and that further in-depth local ethnobotanical studies are needed in Dalmatia to record the disappearing knowledge of edible plants. The use of wild green vegetables (leaves, buds, stalks etc.) is very widespread around the Mediterranean [1, 2]. Although this culinary tradition has decreased due to economic changes in nutrition and agriculture, the contemporary use (at least by older people) of many species of wild greens has been documented in Italy [3–11], Iberian Peninsula [12–17] (but not among the Basque people ), Greece [19–21], Turkey (e.g. ) and Palestine . The phenomenon of the wide use of wild leafy vegetables in nutrition was named herbophilia. In northern Europe a much smaller number of species of wild greens was used and they were associated mainly with famine. This attitude was named herbophobia. It is however unclear how old this division of attitudes towards wild greens is, as, for example in Poland, the use of wild greens has undergone substantial changes (i.e. decreased) since the 17th century . Generally however, peasants from Slavic countries used to resort to just a few of the commonest wild greens, ignoring other species. Exceptions to this are some regions inhabited by southern Slavs, i.e. the inhabitants of Herzegovina [26, 27]; and the coast of southern Croatia - Dalmatia , who seem to have used an exceptionally high number of wild leafy vegetables in nutrition, as pointed out by Moszyński . Unfortunately, apart from Redžić’s works [27, 30, 31] there are no other English-language publications documenting the use of wild food plants in western Balkans. Newer and newer works are published on the ethnobotany of this area, e.g. from Albania [32, 33], Serbia [34, 35], Kosovo [36, 37] and Bosnia-Herzegovina . Although there are also some studies about Croatia [39–41] and about the ancient Croatian diaspora in Italy , this country, one of the largest and most diverse in the region, seems to be the most neglected one. There are a few publications on the use of wild food plants in Croatia. Ljubiša Grlić published a series of wild food guides (e.g. [28, 43]). Although they belong to popular science literature he inserted many valuable observations on the use of particular species in Croatia, particularly in Dalmatia, often quoting concrete sub-regions or islands where a plant is used. Another source of information on the food ethnobotany of the Croatian coast is the work of Bakić and Popović , who organized a census of emergency foods used during World War II in coastal areas and islands, all the way from Istria to Dubrovnik. This work is based on an impressive number of 5000 questionnaires, and lists not only the food use of plants but also land and marine animals. Unfortunately only a list of the most commonly used organisms is included. Valuable information on the wild herbs eaten on the island of Korčula is also present in a conference paper by Sardelić . In Dalmatia most wild greens are used in the form of a mix called mišanca, mišancija, gruda, parapač, pazija[30, 45], commonly sold in vegetable markets. As the first part of documentation of the use of wild food plants we aimed at cataloguing wild food vegetables sold in these markets. Market research is a commonly applied approach in ethnobotany , also for studying the use of wild green vegetables (e.g. [47–49]). One of the pioneers of market research in ethnobiology was the Polish ethnographer Jerzy Szulczewski , who recorded the species of mushrooms sold in the markets of Poznań at the beginning of the 20th century. Plants sold in markets are usually those with highest cultural value. People can easily be approached and interviewed. These methods also enabled the repetition of the study after some years in order to compare the changes in the plants’ availability in markets. Our objective was to record the commonest wild food species of plants sold in vegetable markets in the form of mixes, their names, modes of preparations and origins. The results will be utilized in the future to compare them with local in-depth studies in chosen villages. 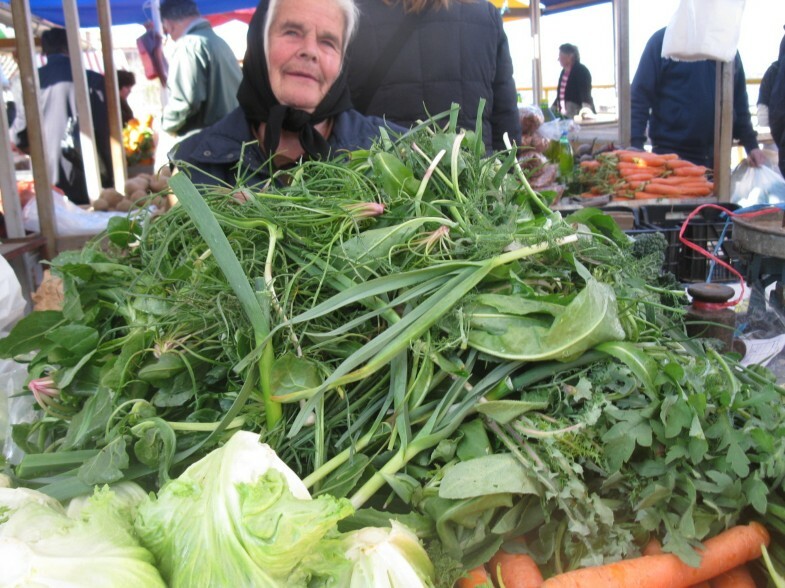 As Dalmatia (outside the tourist season) is sparsely populated, vegetable markets are concentrated on the mainland coast, whereas in the islands only single wild vegetable vendors can be approached. Early spring (the second half of March), during the blooming of fruit trees and the appearance of asparagus shoots, was chosen as the time of study as this is, according to our preliminary information from the inhabitants of Dalmatia, the top season for selling wild vegetables in the markets. Possibly all the vegetable markets of the Dalmatian part of Adriatic coast were visited. These 11 markets (Figure 1) were visited once in the morning (between 8 and 11 am), apart from the market in Zadar which was visited twice. All the 68 sellers of wild vegetable mixes were interviewed. The research was carried out following the code of ethics of the American Anthropological Association (http://www.aaanet.org/issues/policy-advocacy/upload/AAA-Ethics-Code-2009.pdf) and the International Society of Ethnobiology Code of Ethics (with 2008 additions, http://ethnobiology.net/code-of-ethics/). Oral prior informed consent was acquired. The sellers allowed us to search through the piles of plants they sold. The amount of information they supplied varied (some female informants refused to give us their age). The interviews were performed in the Croatian standard of the Serbo-Croatian language (often classified as a separate Croatian language). The piles of vegetables were photographed. Herbarium specimens were collected from the sold plants and occasionally sellers were interviewed with a bunch of flowering specimens collected in the same towns/villages, including plants sold in the markets and those which are not, to give a broader context of plant choice. During each interview we asked which species were collected from the wild and which were cultivated, paying particular attention to Beta, Allium and Brassicaceae species, which could have been of wild or of cultivated origin. Voucher specimens were collected and deposited in the herbarium of the Faculty of Biology of Warsaw University (WA). Precautions for the identification of plants in ethnobotanical studies outlined by Łuczaj  were taken into account. In the case of the specimens without flowers, we tried to identify them using vegetative parts sold and folk names. If the botanical names of plants given as the equivalents of the folk names from Šugar’s dictionary of Croatian plants names  and the other cited papers matched the morphological characteristics of the leaves we collected – such identifications were given but usually labelled with a question mark. The map of the studied markets. The average age of sellers is 63, median - 66.5. Most sellers are women (87%). Some of them are farmers and have been selling plants in the market since their childhood, others only after retirement. Nine men were also encountered, mostly farmers but also one retired restaurant chef. Except for one, who collected the plants himself, it was their wives who collected the mix. Most women sellers claimed that they collect the plants themselves, apart from three younger women who said that their older relatives do it for them. Nearly all the sellers were able to name every species found in the mix. The sellers come to the market well before 7 am and stay until 11 am – 1 pm. The gathered information was also enriched by the personal experiences of the co-authors who have life-long personal experience with living/travelling around Dalmatia (T.M.– around Vrgorac, Imotski, Metković in Dalmatia and Ljubuški, Čitluk, Grude in SW Herzegovina; K.D. – Dubrovnik; M.P. – island of Murter and Šibenik; M.Z.K – Zadar and Grude, Široki Brijeg in SW Herzegovina). It is commonly accepted that research involving many-year participant experiences of the researcher (e.g. having spent childhood in the study area) is a very valuable contribution to an ethnobiological study [53, 54]. The plant nomenclature follows Flora Europaea  with author abbreviations following The International Plant Name Index . 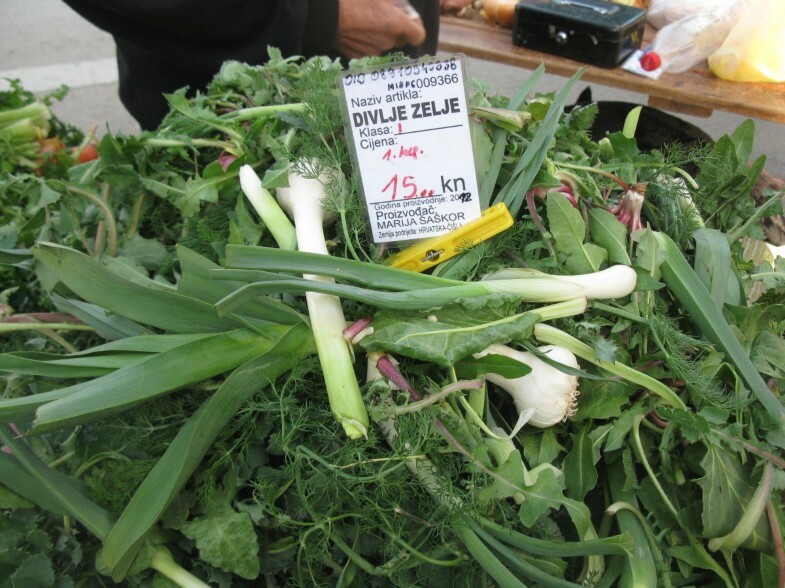 Wild vegetables are sold in all the vegetable markets of Dalmatia. Most sellers along with the mixes sell other plants, mainly home-grown vegetables, home-made olive oil and brandy. Most wild plants are sold in the form of a mix. Only Asparagus acutifolius L. (Croatian šparoga), Tamus communis L. (kuka, kukoce) and Foeniculum vulgare L. (komorač, morač) are sold in separate bunches (sometimes A. acutifolius and T. communis are mixed together). Occasionally a single Asteraceae species is sold separately, mainly Taraxacum sp. or Crepis sp. One seller of Papaver rhoeas L. shoots was encountered in Makarska. In Ploče no one sold a species-rich wild vegetable mix: one lady was selling a mix of Sonchus and Papaver rhoeas and three sellers were selling large bags of Sonchus oleraceus on its own. Three main mix names were encountered during the study: mišancija/mišanca/ mješancija (means literally the mix, especially in western Dalmatia), divlje zelje (literally wild herbs, whole Dalmatia) and pazija (Turkish for beet, Dubrovnik). On average 5.7 species are sold by one seller (median 5, modal value 5). 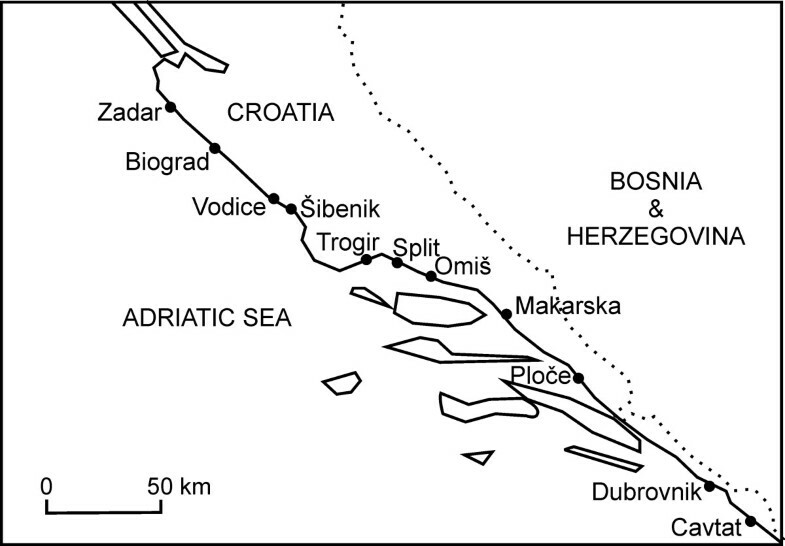 The average number of species in the mix slightly decreased eastwards: the Spearman rank correlation between the position of the market on the coast (Zadar – 1, Biograd - 2, … Dubrovnik – 9, Cavtat −10) and the number of species was r = −0.23, P = 0.064. The total list of plants consists of at least 50 taxa, of which 37 are collected from the wild. The sellers usually sell 1 to 4 kg of the mix per day, charging 10–20 kuna (1.6-3.2 USD) per kg (Figures 2, 3, 4). Most sellers come to the market regularly, at least once a week. They come from neighbouring villages. 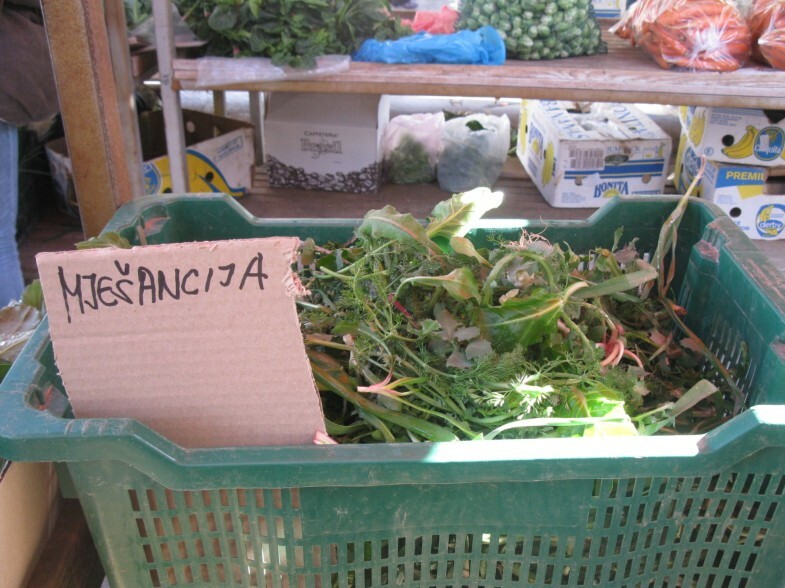 A wild vegetable mix in the market of Omiš. A wild vegetable mix in the market of Šibenik. One of the oldest sellers of wild herbs in Dalmatia (Šibenik), aged 80, who has been selling the mix for over 60 years. Most of the bulk weight of the mix is composed of a few most commonly used species (Table 1). The composition is repeatable although often one to three of the commonest species are missing. The most often used species are sow thistles (Sonchus spp. ), beet (Beta vulgaris L.), wild leek (Allium ampeloprasum L.), wild fennel (Foeniculum vulgare Mill. ), prickly goldenfleece (Urospermum picroides F.W.Schmidt, this species only in the Dubrovnik area), bristly ox-tongue (Picris echioides L.), common poppy (Papaver rhoeas L.), wild carrot (Daucus carota L.), dandelion (Taraxacum sp. ), white campion (Silene latifolia Poir.) and a group of Cichorioideae (Asteraceae) taxa called žutenica/radić (mainly Crepis spp. and Cichorium intybus L.). (?) uncertain identification based on small sterile specimens. B - Biograd, C - Cavtat, D – Dubrovnik (2 markets), M - Makarska, O - Omiš, P - Ploče, T – Trogir, V - Vodice, S - Split, SS – Šibenik, Z – Zadar; * - a cultivated taxon; ** - commonly sold separately in most of the studied markets. Two group taxa involving several botanical species should be pointed out. One is žutenica/žućenica or radič/radić. This category encompasses a large number of Asteraceae (Cichorioideae) species. These are predominantly Crepis spp. (C. biennis, C. zacintha, C. sancta) but also other related genera (Taraxacum officinale Weber, Leontodon taraxacoides (Vill.) Mérat, Reichardia picroides (L.) Roth, Cichorium intybus L.). The respondents do not distinguish them well and usually cannot link the collected rosettes to the flowering forms. Some respondents even claimed that žutenica/radič have no flowers and when these plants flower they stop being žutenica/radić. Another collective name is kozja brada (literally goat’s beard) applied to at least three separate Asteraceae taxa (Tragopogon spp., Scorzonera laciniata L. and Scorzonera villosa Scop). The sellers claim that they collected the plants in their home gardens or their vicinity, near the sea or in manure-fertilized arable fields. One of the sellers in Šibenik claimed that she waters the arable land on purpose to enhance the growth and germination of edible herbs. The sellers state that the tradition of eating wild herbs has been alive as long as their grandparents remember. Until the 1960s herbs constituted a substantial part of people’s diet, but nowadays are used only occasionally, for example once a week as a side dish. They are boiled for 10–30 minutes, strained and seasoned heavily with olive oil and salt (e.g. 1 kg of wild herbs to 100–150 ml of olive oil). Sometimes also pršut (dried Croatian ham) is added. In the past (until the 1960s) the wild herbs were mixed with boiled potatoes, polenta or any other starchy products which were available. Another change our interviewers noticed is that now people have stopped collecting edible roots, they collect only leaves and stalks. For example before and during World War II, people were also eagerly seeking Daucus carota and Eryngium sp. (information from respondents in the market of Zadar and Vodice). In contrast to the thoroughly boiled wild vegetable mix, žućenica/radič Asteraceae are eaten raw or boiled for a very short time. Why was such a rich heritage of wild vegetable gathering preserved in Dalmatia (and in Herzegovina) and not in most other Slavic countries [25, 57] or for example in the neighbouring Hungary ? Even in northern Croatia the use of wild vegetables is much less widespread (authors’ personal observations). Two overlapping explanations are possible. One is that the high importance of wild vegetables is a remnant of the ancient Greek-Roman culture around the edge of the Mediterranean. Dalmatia was for a long time a part of the Roman Empire and the later Venetian state, and many towns were founded by the Greeks. Radič is actually a name of Greek origin (Cichorioideae plants are called similar names, e.g. ραδίκια in Greece). Another explanation is ecological-economical. Until the development of tourism, Dalmatia was the poorest part of former Yugoslavia – a rocky barren land where people had to eat wild produce to survive. The rocky dry hills were inhospitable to many cultivated vegetables, so people had to maintain knowledge of wild vegetables. The results of the study show that collecting and selling wild green vegetables is still widespread in Dalmatia. At least 37 species are still gathered. Such a large number of wild greens is similar to wild vegetable mixes from Italy (e.g. [3, 4, 59]. However data supplied by Bakić and Popović , as well as the large number of species reported by Grlić  as sold in the markets of Dalmatia and our own participant observation and personal experiences (Table 2) suggest that a strong decrease in the number of the gathered taxa has appeared and the gathering is restricted to a fraction of the population. It should also be borne in mind that the list of taxa comes from a large area and on the scale of one market the number of taxa was much lower than in the previously mentioned Italian ethnobotanical studies. Sonchus spp. (Asteraceae), including Sonchus asper (L.) Hill ssp. glaucescens (Jord.) Ball, S. oleraceus L. ,S. tenerrimus L.
B – Bakić and Popović  (in this study it is unclear if the data is about eating green parts or underground organs, G – Grlić , C – Ćurčić , D - personal observations of Katija Dolina from Dubrovnik, one of the coauthors, M – personal observations of Tihomir Milicević from central Dalmatia and SW Herzegovina, one of the co-authors, P - personal observations of Marija Pandža from the island of Murter, R – Redžić  – beacuse this study encompasses a large number of species from the whole of Bosnia-Herzegovina, only the species listed by the other authors or found in the markets were confronted, S- Sardelić , ** – most commonly sold wild greens in Dalmatian markets in 2012 (this study), * – less commonly sold wild greens in Dalmatian markets in 2012 (this study). An interesting issue is presented by differences in preparation techniques for wild greens encountered in the Mediterranean. In Italy wild greens are usually eaten fried (often with eggs), after the initial boiling, or made into a soup [3–6, 59, 60]. In southern France they are often eaten raw with dressing , whereas in Croatia most wild greens are boiled for a long time (usually nearly half an hour) and then dressed with olive oil (although some Asteraceae are eaten raw and Asparagus and Tamus are usually fried with eggs). Such way of preparation is similar to the Greek way of preparing horta (gr. χόρτα, khorta, chorta), traditional mixture of wild herbs still widely consumed in today's Greece . This way of preparing wild greens (boiling for a long time and straining) may be the most primitive way of preparing wild greens, an adaptation for eating large amounts of them, since most toxins are removed. Eating wild greens as raw salads in France may be the result of a general trend of serving raw salads in France, and frying is possible only when larger amounts of oil are available. The respondents mentioned a few times that they had noticed an increasing number of young health-oriented people (vegetarians etc.) buying the mix. This goes along with a similar trend in other European countries . Thus an interesting phenomenon may be developing. The gradual decrease in the knowledge of plants is counteracted by specialized sellers who are the main holders of knowledge and suppliers of the plants to increasing circles of people. More local in-depth studies are needed to assess the relationships of the plants sold in markets with the plants known and used by the whole population of Dalmatia. It is however without doubt that the custom of selling wild vegetable mixes has a long uninterrupted tradition and represents a part of the traditional Dalmatian heritage, although throughout the last several decades it has changed from a dish enriched with starchy foods to a separate salad or side-dish. At the moment very few restaurants on the coast sell the wild vegetable mixes (e.g. a hotel in Makarska), however increasing numbers of people in Zagreb, the capital of Croatia, buy the mixes imported from Dalmatia and sold in Zagreb markets. It is surprising that some wild vegetables, abundant in the study area and used in other parts of the Mediterranean, and even among Croatian population in the neighboring Bosnia and Herzegovina, e.g. Malva spp. and Silene vulgaris (Moench) Garcke were not recognized as edible plants by the sellers (they were presented to them in a fresh state, gathered from the neighbourhood of the markets). Similarly Stellaria media (L.) Vill. is not eaten. It is often present as an unintentional admixture in the mix and every time respondents said that this is only trava (herb/grass) and threw it out of the mix, ashamed of the “contamination”. Polish economic botanists Rostafiński  and Maurizio  were interested in the process by which dishes from wild vegetables gradually turned into dishes made of domesticated greens. The former found that the northern Slavic soup borsch (Polish barszcz) was originally made with Heracleum sphondylium L. but gradually throughout the 17-19th century was turned into a soup dominated by the cultivated beet Beta vulgaris L. subsp. vulgaris L. Łuczaj  in his review of changes in the use of wild vegetables in Poland found more such functional pairs of wild greens and the cultivated greens, which replaced them: ground ivy Glechoma hederacea L., versus parsley Petroselinum crispum (Mill.) Fuss as well as fat-hen Chenopodium album L., versus spinach Spinacia oleracea L. and Brassica spp. It is not unlikely that a similar process occurs in Croatia, as several cultivated vegetables are added into mišanca now. It should be noted that the majority of beet sold in the market is now the cultivated form, whereas in the past more wild beet was sold. Although most wild vegetables sold in the markets of Dalmatia are the species commonly consumed in southern Europe, the use of a few of the species, namely Scorzonera laciniata, Urospermum picroides and Ranunuclus neapolitanus is not reported by any major directories of edible plants (e.g. [66–70]). Wild edible plant mixes are sold widely in Dalmatia and present in every market. However they are relatively species-poor, usually composed of just a few species of wild and, to a lesser extent, cultivated vegetables. The selling of these mixes has a long, continuous tradition remembered by respondents since childhood. Signs of both the degeneration and revival of the tradition are present, however a decrease in the general knowledge of plants among the population of Dalmatia is obvious. Further studies are needed to establish the relationship of the market-sold mixes to the choice of plants gathered for individual use, although it is probably similar. Many thanks to the Lalić family, especially Olga Krowicka-Lalić for help of various kinds. The research was financed by the Institute of Applied Biotechnology and Basic Sciences, University of Rzeszów, and by additional financial support granted by the Rector of University of Rzeszów. MZK and ŁŁ initiated the study and gathered the literature. ŁŁ performed the interviews and identified most plants. MZK, TM, KD and MP enriched the study with personal long term observations on the subject and helped to draft the results and discussion sections, as well as to identify some taxa. All the authors read and discussed the final form of the article.